Colliery engineers such as George Stephenson, William Hedley and Timothy Hackworth played a significant role in steam engine development during the early years of the nineteenth century. Even up through the 1970s, despite mine closures, the National Coal Board still owned a fleet of steam engines totalling 104. Thirty-one of these have been preserved by enthusiasts and some of these workhorses are featured in this latest addition to our Colliery Steam series along with other, now sadly missing, examples of British industrial ingenuity and craftsmanship. Included are some close ups of engines such as �Gamma� at work at the Vane Tempest Colliery just North of Seaham Harbour; Andrew Barclay 0-6-0ST at Shotton; NCB No. 2502/11 Delta at Blackhall Colliery and NCB Nos. 6 and 48 pushing a long train across the 'school' level crossing just North of Eccles Colliery. Also photographed are the buildings and engines of the Bowes Railway Centre at Springwell. 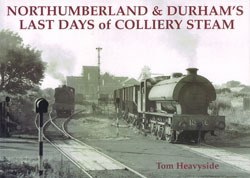 As always, Tom Heavyside�s text is full of the fascinating history and details that we have come to expect of his books.